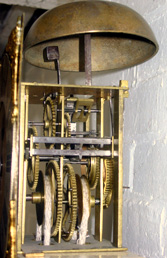 The earliest known Tonbridge clocksmiths are William Harris, who was in business between about 1684 and 1725, and his son Stephen, who was baptised at the Parish Church on 12th September 1692 and died in about 1755. The clock shown here was made by Stephen Harris in about 1720-30. It is described as a '30-hour wallclock'. Like many clocks of its time it only has an hour hand, so it is only possible to estimate the time to the nearest five minutes or so. It needs to be rewound daily. The clock was restored in 2004 by an amateur clockmaker from Tunbridge Wells, Mr Douglas Millson, whose father had worked as a clocksmith in the Tonbridge area, and generously returned by him to the town where it was made. The dial and works are original, but the wooden case is modern.